A very interesting topic of server administration is the choice of a nice MySQL-Server for high performance purposes and solutions. Many people underestimate this choice, which is surely a huge mistake! The correct research before setting up your database server is the first step into a really good direction. Let us talk about the MySQL-Server solution of Percona a bit. This is my personal choice and I will give you some basic background information and nice to knows about it. I recommend at least basic knowledge of MySQL to understand most of the things explained in the following part. Before I will go into detail, I want to show you a graphic from Percona.com which shows where the story goes. Stability here does not mean that the server is free of crashes, because you can truly say that this counts for all MySQL versions too. It means the stability on which Percona answeres database questions or executes queries and prepared statements. This really is a must have if you want to run powerul applications without lags or huge overload. Of course the benefit depends on the usage of your database server (READ- or WRITE-heavy), but this can never be a disadvantage. 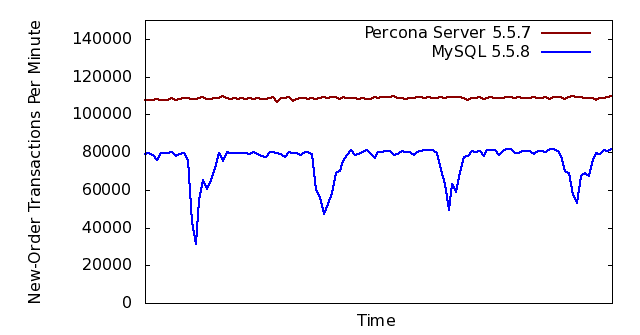 In the graphic above you can clearly see the amazing difference between MySQL- and Percona-Server! In my experience, with WRITE-heavy databases, it is really needed to guarantee a stable and consistent service. As you can see in the graphic above and read in the article on Percona site, it is 40% faster than MySQL! To repeat this: Without doing anything you simply get much more efficiency! Now imagine this combined with Server SDDs and more performance changes you did manully. I think every additional word is wasted here. There are more reasons to use Percona Server of course, but I think the most doubts are killed by explaining stability and performance advantages above. I hope you enjoyed reading this and maybe switch to Percona Server too. If you have feedback, regards or corrections please let me know! Any time soon a tuturial for installing and setting up Percona will follow. Additionally I will show you how to optimize and tune your Percona- or MySQL-Server on your purposes in another tutorial. 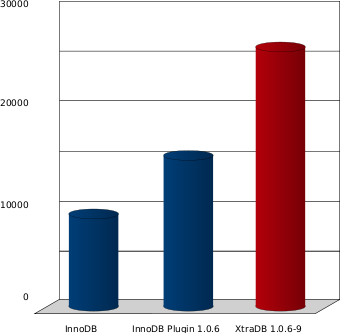 This entry was posted in MySQL and tagged InnoDB, MySQL, Percona, XtraDB by DoesntMatter. Bookmark the permalink. Thanks you very much for the info! If you need some more information about this, please let me know. Thank you very much! Nice to hear that you like it. Danke für die Informationen! Ich habe wirklich nicht viel Ahnung von PCs & dem Kram außen rum, aber es interessiert mich trotzdem. Aloha dude! I really respect what you’re posting here. Keep working that way. Nice to hear, thank you!